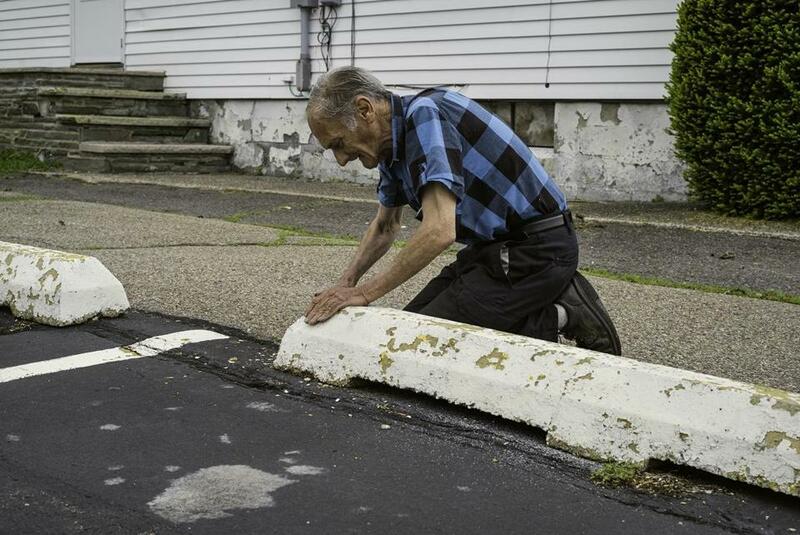 An elderly man kneels on the sidewalk beside a parking curb. His hand rests on the curb, nails long and dirty, skin creased with age. Is he repainting the curb? Or has he fallen? Justin Kimball’s timely, sobering photographs at Carroll and Sons depict the fallen: houses caved in, shops demolished. But they also picture the scrappy: people and communities sticking out, hard times. The photo of the old man, “Wyoming Avenue,” shows either or both, depending on what you bring to it. Kimball, who teaches at Amherst College, traveled to tumble-down neighborhoods in Massachusetts, New York, and Pennsylvania, photographing buildings and people in towns apparently deserted by industry. Property values have sunk and abandoned houses pock the landscape, but residents stay, loyal to their communities or maybe too strapped to move. There are lucid stories of struggle and the bonds of family and friends in Kimball’s compelling, necessary images of people. But his forceful photos of buildings and streets dominate. A shallow depth of field pushes imagery to the forefront, like sets looming at the rim of a stage; tight compositions could induce claustrophobia. “Lincoln Avenue” jams many walls into the frame: the back of a worn shed; a wooden fence; clean green siding on the corner of a house; shingles shedding and broken windows on the side of another. The eye ricochets from one surface to the next, trapped, finding hope one moment and despair the next. Kimball shot “Shenandoah” from inside a partially destroyed building. Perhaps there was a fire. A puddle on the floor reflects the sky. Windows in the sooty concrete wall open to another world: houses across the street under a blue sky. How can it be that life continues amid such decay? But it has for decades. These communities are easy to ignore if all you’re doing is driving through. The people in Kimball’s photos are tired and disaffected. It’s time to pay heed.